Rayman Legends is headed to the Wii U, a new leaked trailer reveals. It's bringing legendary settings, new playable characters, touch screen controls and NFC (near field communication). 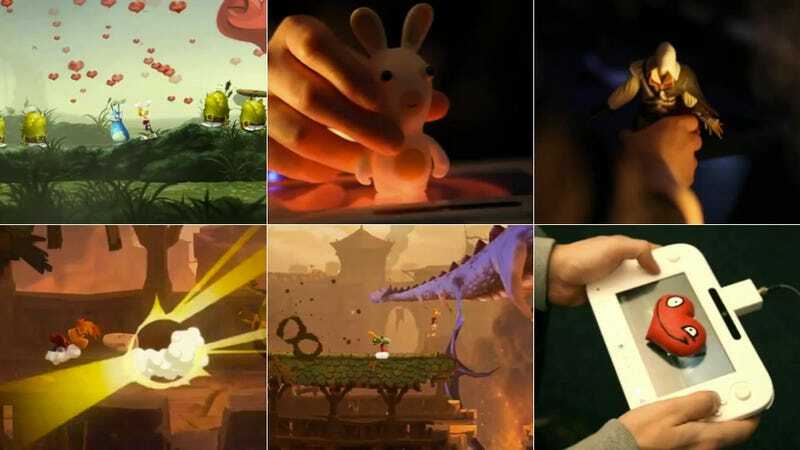 The trailer shows off the four-person multiplayer as well as its swiped-based touch controls. The clip shows three on Wii-Remotes, and one player using the new Wii U controller. The game also has online and social features. The Wii U controller also offers NFC. Players can rest a Raving Rabbid on the Wii U controller screen, causing it to appear in game. Hearts apparently can be conjured simply by placing a heart on the screen. At the end of the trailer, Ubisoft hints that Assassin's Creed's Ezio will appear in the game when a player reaches for an AC figurine. There is also Back to the Future music. Previously, a survey seemed to leak some of Rayman Legends' classical settings.